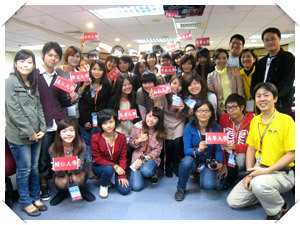 In 2011, PeoPo - Taiwan Citizen Journalism Platform (www.peopo.org) - began using emerging network technology and programs, as well as multidimensional activities to help build closer links in the civic community. The addition of Facebook to PeoPo created enthusiastic interaction from social groups, and the raising of numerous citizen-journalist gatherings left CJs pleasantly satiated. Moreover, outside in the traditional media world, there has been a clear upsurge in citizen-journalist fervor. In order to boost enthusiasm in citizen journalists, PeoPo has diligently worked nonstop for over one thousand six hundred days. In 2011, with the aim of enhancing the story-telling ability of citizen journalists, PeoPo launched ‘Citizen Journalists Rise Up’ and ‘Citizen Journalist Video Workshop’. In addition, PeoPo also set up the program ‘Peopo News - Voice Out in the South’, inviting central and southern citizen journalists to share shooting tips, balancing the gap between the North and the South and expanding the influence of citizen journalism. In terms of PeoPo’s core services in the domain of the Internet, PeoPo established the ‘Disaster News Zone’, and through enhanced site functionality, increased exchange between community websites and independent citizen-media sites. 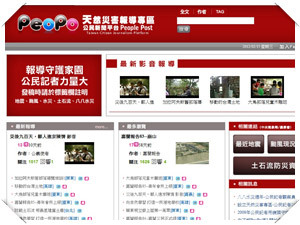 PeoPo’s achievements have also earned it the recognition of the International Federation of Journalists and at the Taipei 2011 - IPI World Congress, the development of citizen journalism was a hot issue receiving a great deal of attention. On top of all this, other activities raised by PeoPo include ‘Community College Civil Media Teachers Camp’, ‘Regional Citizen Journalists Gathering’, ‘University Campus Chief Editor’s Meeting’,’ and ‘Citizen Journalism Training Camp’ etc., all of which have helped to strengthen interactive exchange between citizens journalists. With the support of more than 5,000 citizen journalists, it is clear that PeoPo has become a potent force on the road towards our goal of a civic society.